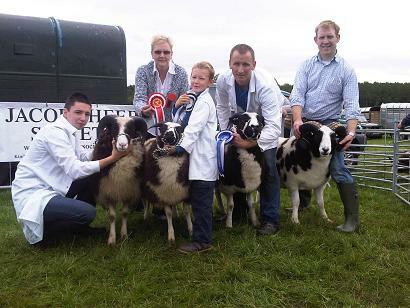 Northern Ireland Show & Sale – Saturday 20th August – The 4th Official Northern Ireland Show & Sale will take place on Saturday 20th August at Gortin Mart, Co Tyrone (Show 11.30am, Sale 1pm). 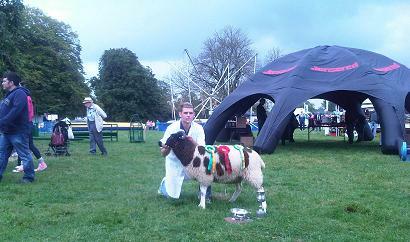 Please note all sheep must be penned by 10am. 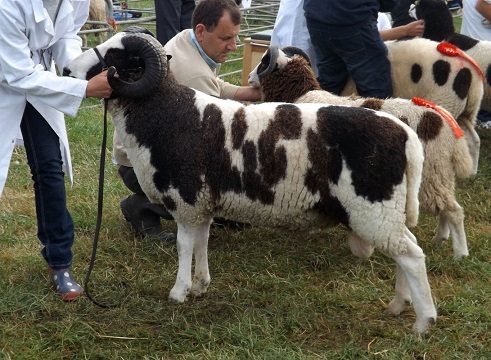 The quality of sheep at last years Show & Sale were excellent and this is a credit to our members who strive to bring the best sheep that they can to their local sale. 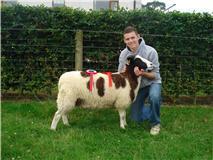 The judge this year is the Scott Dalrymple (Scotland). 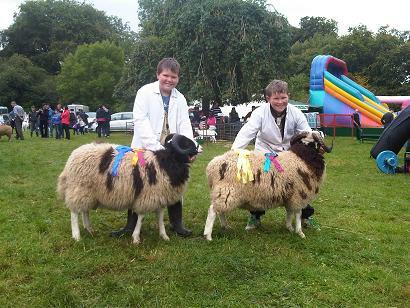 All sheep sold in the pedigree section will have to go through a pre show inspection before they are sold to make sure they reach the societys Breed standard requirements. This gives the buyer the assurance that they are only buying the best quality stock. 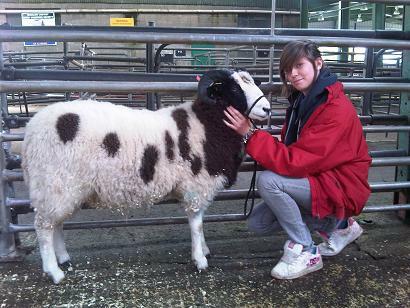 There will be 150 plus pedigree and non pedigree sheep for sale. 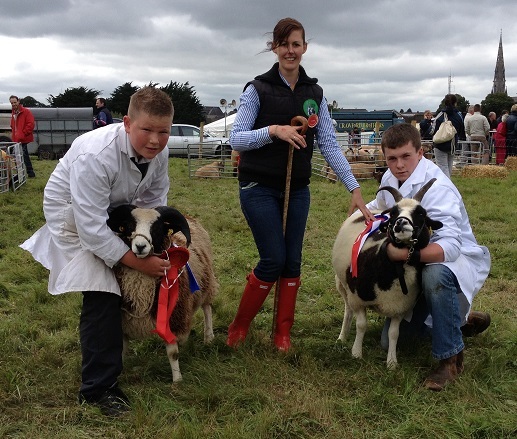 Southern Ireland Show & Sale – Saturday 24th September – The Southern Ireland Official Show & Sale will take place on Saturday 24th September at Blessington Mart, Co Wicklow – Show 11am,Sale 12pm. Mike Bundy will be travelling over from England to judge. 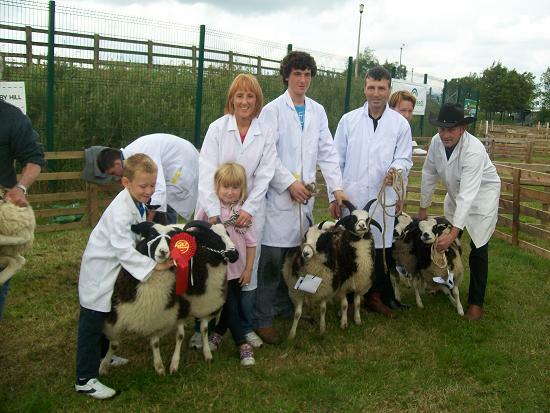 All sheep to be sold will have to go through a pre show inspection before they go in the show ring to make sure they reach the societys Breed standard requirements. This gives the buyer the assurance that they are only buying the best quality stock. I encourage as many members as possible to support this sale by bringing good quality stock. 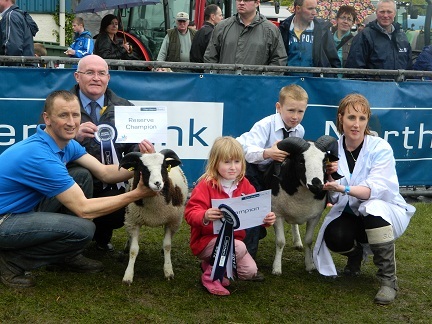 Show Competition 2016 – The Show Competition was a huge success in 2015 and it will run again in 2016. 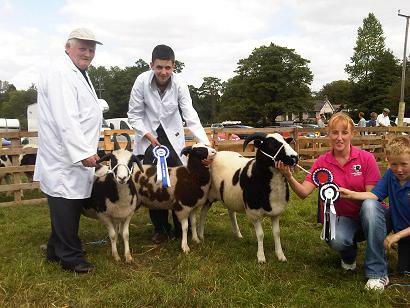 It will include 9 shows (North & South) and points being awarded for attending shows, 1st,2nd & 3rd place in Ram, Ewe, Ewe lamb & Ram lamb classes and for Champion & Reserve Champion. 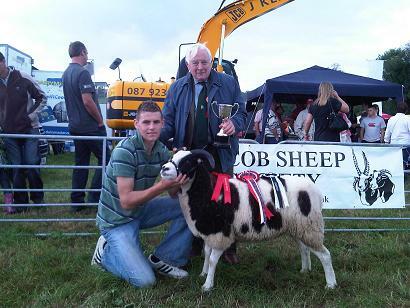 Showing at local shows is a great opportunity to meet other members and to show the general public the quality of Jacob sheep that are currently in Ireland. A big thank you to Richard Beattie Livestock Sales(Gortin) who has kindly sponsored this event for the third year running. 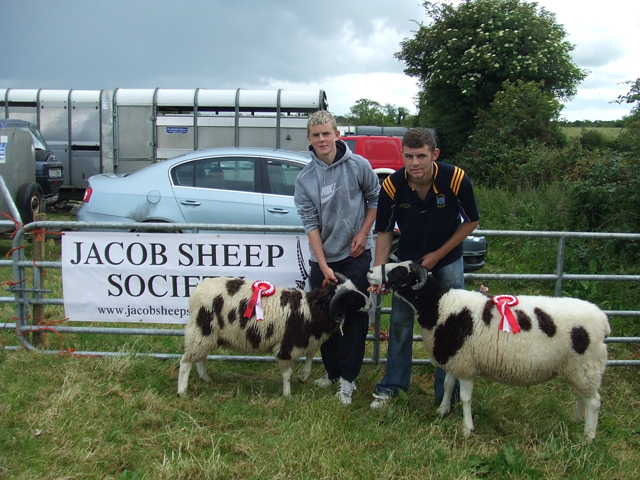 The Jacob Sheep Society and the Ireland Region would like to welcome our newest members – Mr Chris Martin (Cookstown), Geanette stephens & Michael Butler (Gowran), (Jan Carrington (Roundwood), Master Ryan Fair(Newtownstewart) and Mr Sammy Wasson (Letterkenny). I hope that you enjoy being a member of the Society and I hope to meet you in person at one of our Regional Events. 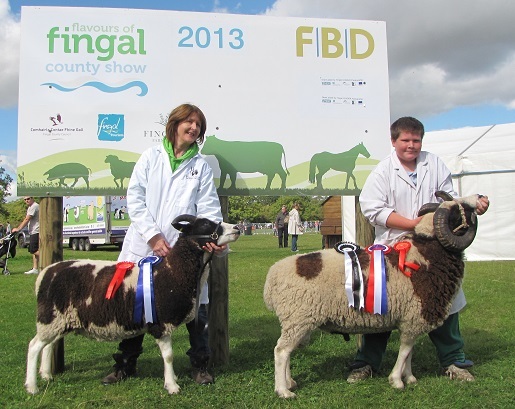 Ireland Region Open Day (Saturday 27th June) – The Ireland Region Open day will be hosted by Geraldine & Nicola Fletcher (Stonecroft & Sugarloaf flocks) on Saturday 27th June at their home in Roundwood, Co Wicklow. The Open day will start at 2pm and there will be plenty for young and old to do throughout the day. 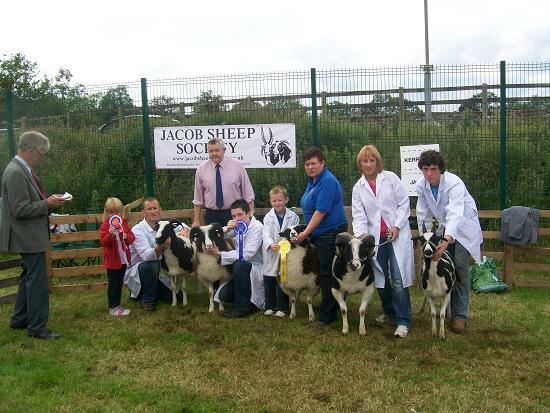 Along with the opportunity to see some of the best Jacob sheep in Ireland there will be a stockjudging competition, Preparing sheep for show demonstration, Talk by local vet, Auction, Kids games, Barbecue and many more events on the day to keep us entertained into the early evening. Open days are a great way to meet other members in our region and it is also a great opportunity to encourage anyone who is considering keeping Jacobs or joining the Society to come along for the afternoon. There are lots of B&Bs and hotels nearby for any members who would like to stay for the Saturday evening. The Coach house B&B –Roundwood (Tel -00353012818157) have rooms available at €40 per person and some rooms have already been booked by members who are intending to stay overnight. If attending the Open day please contact me via phone(07715326021) so that we have an idea how many numbers to expect on the day. Directions will be sent out with the Ireland newsletter in May. Hope to see you there. Judges Seminar – Friday 3rd July – There will be a judges seminar held on Fri 3rd July at Kingarrow Jacobs (P&S Colhoun) at 1pm. This event is being run for all judges to attend and is open to any members who would like to come along. It should be an interesting afternoon and plenty of topics about the Jacob breed will be discussed. 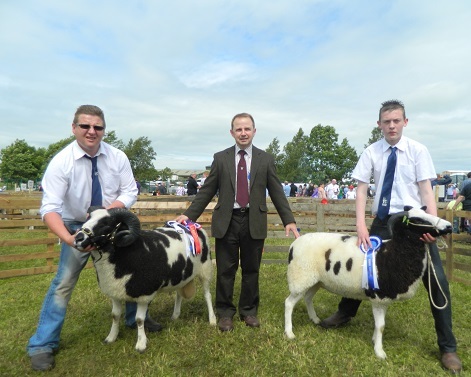 The society field officer, Gordan Connor is travelling over from Scotland to run this event and to also judge the Jacob classes at Omagh show on Sat 4th July. 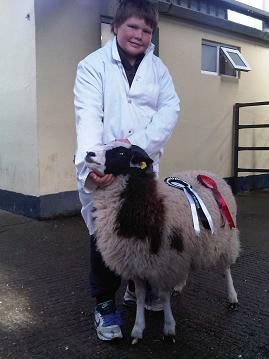 The address for the judges seminar is – 25 Kingarrow road, Omagh, Co Tyrone, BT79 7TX. 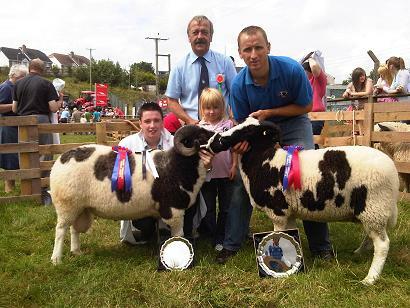 Northern Ireland Show & Sale – Sat 15th Aug – The 3rd Official Northern Ireland Show & Sale will take place on Saturday 15th August at Gortin Mart, Co Tyrone (Show 12pm, Sale 1.30pm). 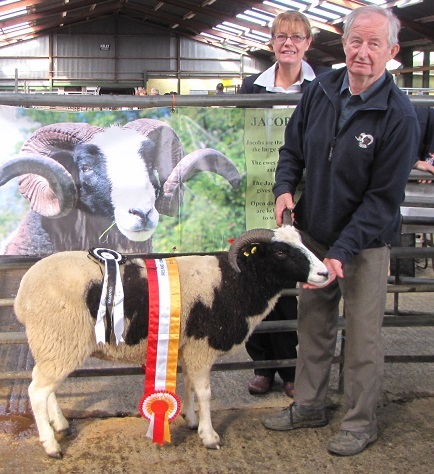 The quality of sheep that were brought to the Show & Sale was excellent and this is a credit to our members who strive to bring the best sheep that they can to their local sale. 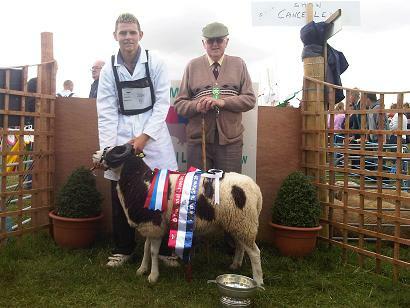 The judge this year is the Society field Officer, Gordan Connor. Southern Ireland Show & Sale – Wed 26th Aug – The S.Ireland Show & sale will take place on Wednesday 26th August at Tullamore mart, Tullamore. (Show 11.30am, Sale 1.00pm). I would urge all members in the South of Ireland to support this new Show & Sale and to please get your entries in by the required deadline date. 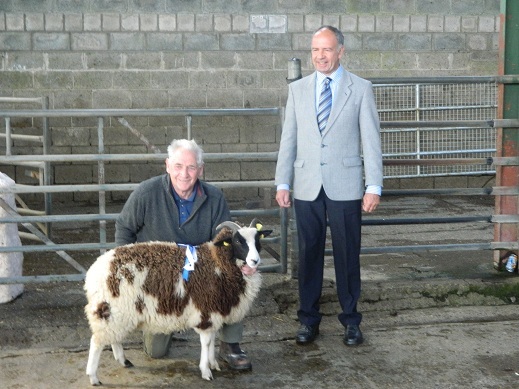 The new date in August was decided at the AGM in November 2014 and this should hopefully mean that members lambing in March & April will have lambs ready for the sale. 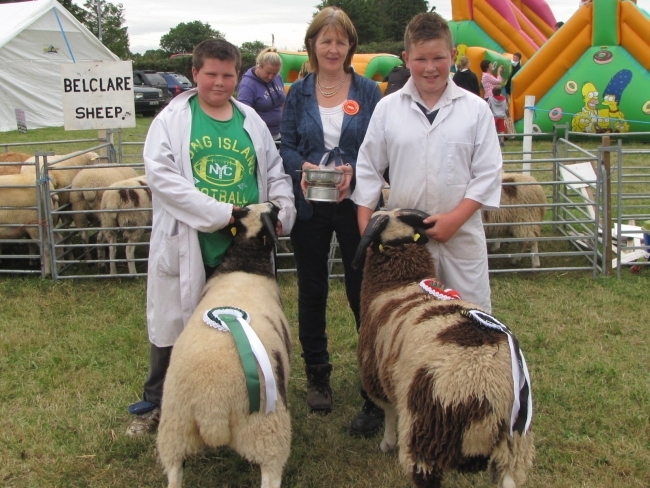 Barbara Webster will be travelling over to Tullamore to judge the classes and a full inspection team will be in place as normal to check that all sheep are up to Breed standard. 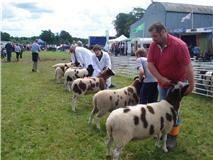 Gosford show was a very enjoyable day for all members who attended. 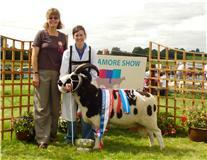 A big thank you to our judge for the day, Nicola Fletcher, who travelled from Co Wicklow for the show. 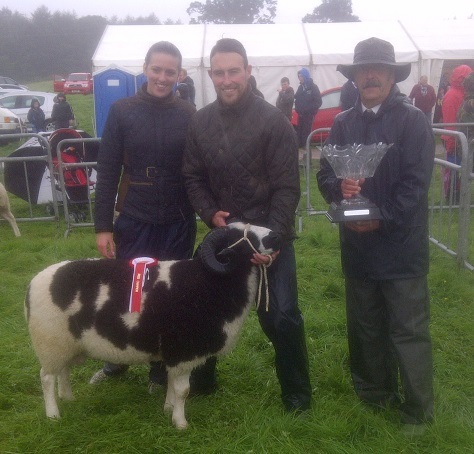 Congratulations to Jonathan and Ruth Harkness who received the championship rosette with their lovely 2 horned shearling ewe and the reserve championship was awarded to P&S Colhoun with their 2 year old ram. 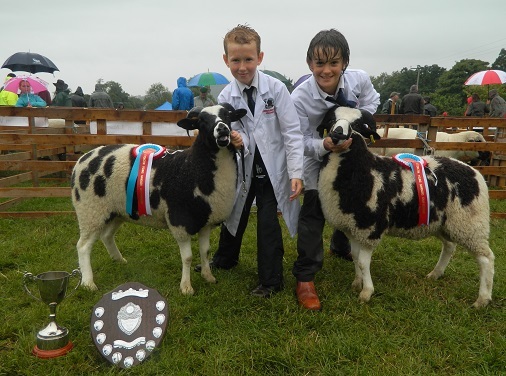 A big congratulations to Alex Colhoun and Jonathan Harkness who were awarded 1st and 2nd in the interbreed ram lamb challenge against a very strong line up of 13 other breeds. 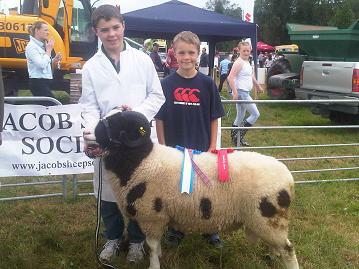 This is the 1st time a Jacob has won this award and is great for breed promotion. 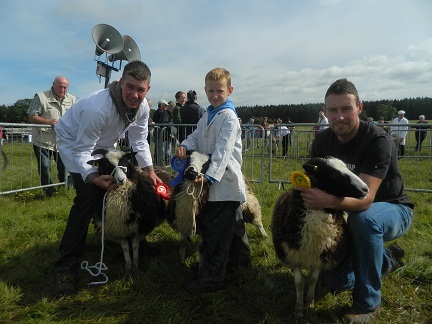 The judge William Carson commented how good the two ram lambs were after the judging was over. 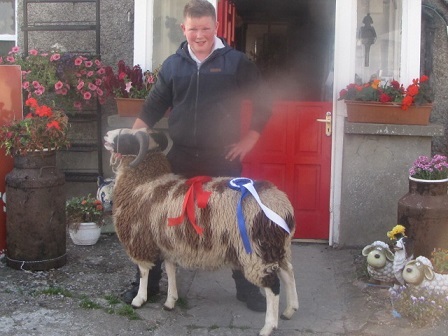 Jimmy McGrath also received 4th place in the interbreed ewe lamb challenge with his lovely 2 horned ewe lamb in a 15 strong line up. 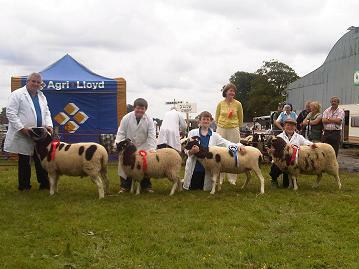 Well done to everyone who attended the show. There were no exciting prices to report from the sale ring as most members had sold their stock at the official show & sale at Gortin. 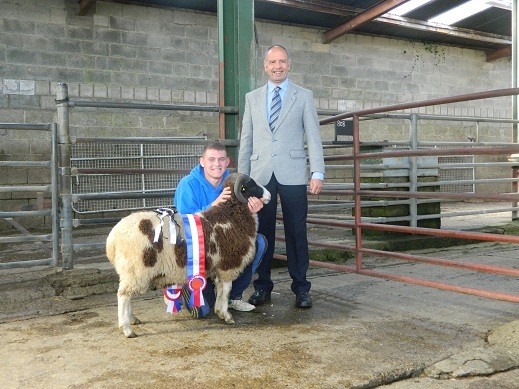 Northern Ireland Show & Sale – Gortin – Saturday 16th August – The 2nd official show and sale in Northern Ireland proved to be another huge success and although the weather tried to dampen our spirits, it didn’t affect the superb prices in …the ring. Clive Richardson, Gordon Connor and Scott Dalrymple travelled over from the UK to carry out the pre-inspection and judging. 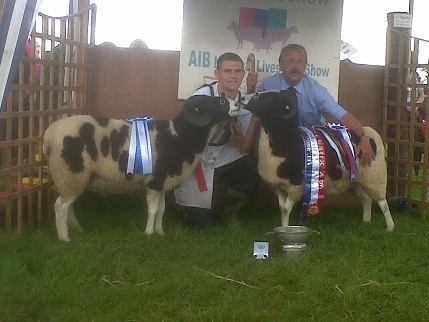 Clive awarded champion to P&S Colhoun with their shearling ewe, reserve champion to P&S Colhoun with their shearling ram and second reserve champion to J McGrath with his lovely 4 horn ewe lamb. 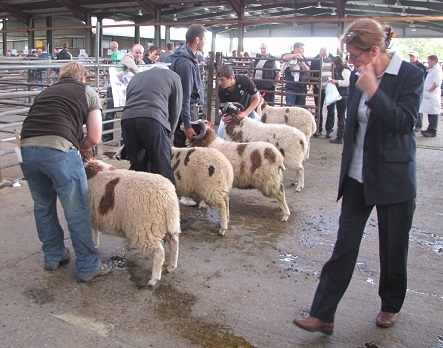 There was an excellent turnout of quality sheep at the sale, this was demonstrated in the ring with the great prices on the day. 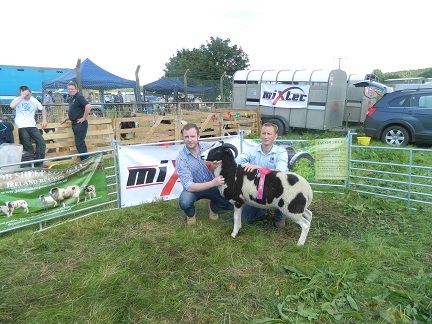 The Ireland Region would like to thank Richard Beattie Livestock Sales for hosting the event again this year and to all the local businesses who sponsored the event to make it possible. A huge thank you to all members who supported the event by either selling or buying in the ring. Without your on-going support, this event would not be a success. 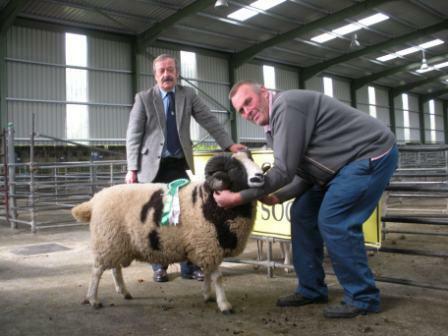 Northern Open Day – To be held at the home of Adrian Hamiltion (Dunmullan, Omagh). Saturday 1st June at 1pm. 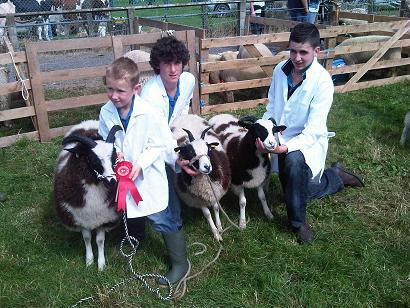 The Beltrim Jacobs were the 2012 Small Flock Competition winners. 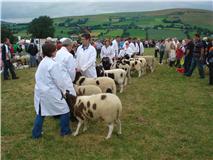 This will be a great opportunity to see some excellent sheep on display. There will be a Stock Judging Competition and a talk from a local Animal Nutritionist (Dr David Hawkes) who will be giving us good advice on the correct meal to be fed throughout the year. Lunch will be provided by our hosts and we will be sampling some Jacob meat on the barbecue. 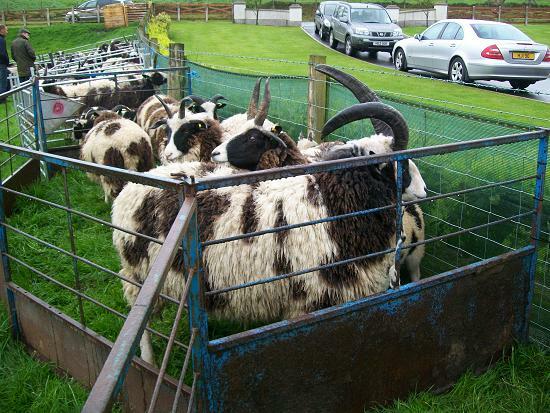 Unofficial Northern Jacob Show and Sale – Gortin Mart (County Tyrone). Saturday 10th August at 1pm. This is a new event for 2013 and I am hopeful that all Northern Members will enter some sheep to make this sale a success. 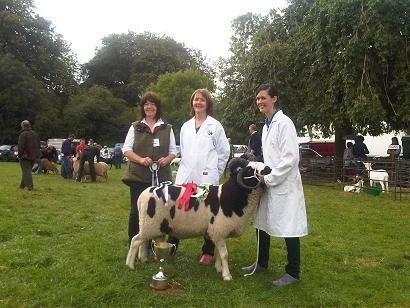 Jean Blacknell who has been a long standing member and Field Officer for the Society will be travelling over from England to judge the show. 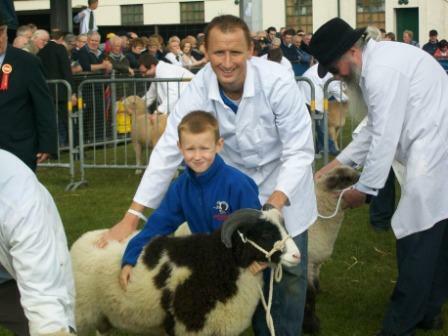 Gordan Connor (field officer) from Scotland will be the attending and will be doing the pre show inspection of all sheep entered in sale. 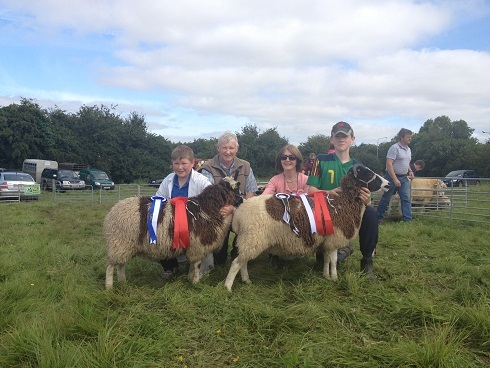 Northern Open Day (1st June) – The Ireland region held the northern open day at the home of Adrian Hamilton (Beltrim flock, Gortin) on Saturday 1st June. There was an excellent attendance with over 50 people attending and the weather was very kind to us on the day. 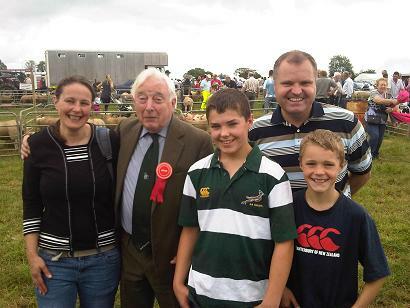 The members had the opportunity to see the small flock winners for 2012 up close and there was a stockjudging competition were everyone had the chance to judge 6 shearling ewes in order of preference. 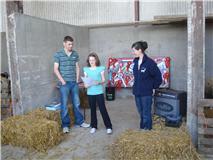 Derek Mcmillan was the judge at the open day and he explained his choice to everyone and reasons why. 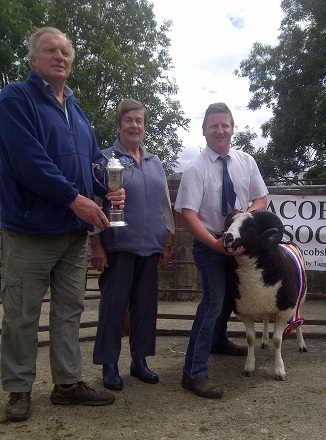 Mark Lucy was the winner of the adult stock judging and Jack Colhoun won the under 12. We then had a very interesting talk by Dr David Hawkes on animal nutrition which everyone seemed to enjoy. We then were treated to an excellent barbecue provided by our hosts and everyone got the opportunity to taste jacob meat from the barbecue. A big word of thanks to our hosts for all the effort that went into the organisation of the day. 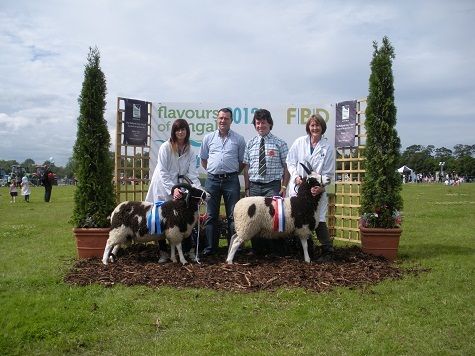 Flock Competition – (21st to 23rd September 2012) – Jean Blacknell and Jean Simmons will be travelling over from England for 3 days to assess our flocks. 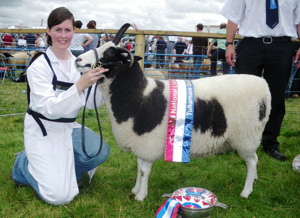 This is a great opportunity to get some very good advice about our sheep and each visit should take approx 1 hour. It will cost each member £15 (18 euros) and this can be paid on the day or can be given to any member of the Ireland Committee. Please RSVP to (paulcolhoun@gmail.com) or telephone on (07715326021) by the 12th September if you will be taking part so that we can plan the travelling arrangements and times for each visit. I would encourage all members to enter this competition as it will be very worthwhile advice from two very experienced judges. 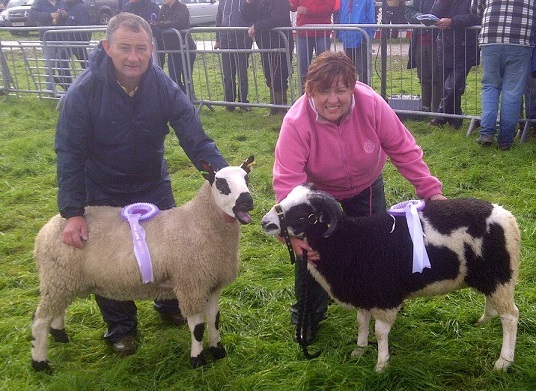 There will be two new cups for the winners (Large Flock and Small Flock). 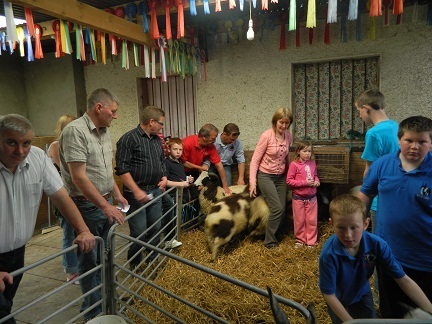 Southern Open Day (13th May) – We held our first open day of the year at the farm of Karl Gill & Family. It was a very enjoyable day with a good turnout of members. All guests were treated to a fabulous lunch and a big thank you to Karl and family for going to so much effort. There was a Stock Judging Competition for everyone and our special guest speaker gave us an informative talk on how to control worm problems in our flocks. 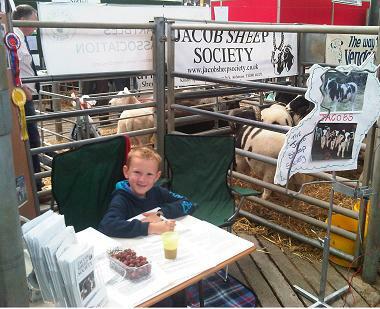 Balmoral Show (17th May) – This was the first year that we had individual Jacob Classes at the biggest show in the North of the Province and it was great to see such a big turnout of members. 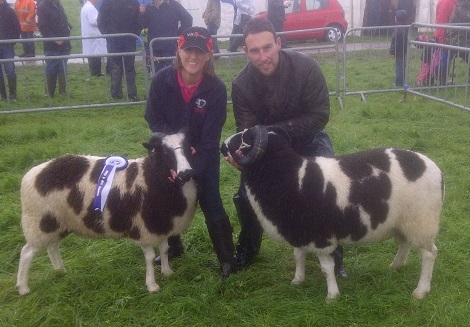 The Champion of the show went to Sharon Colhoun with her Two Horn Ram and Reserve went to Alex Colhoun with his Ram Lamb. 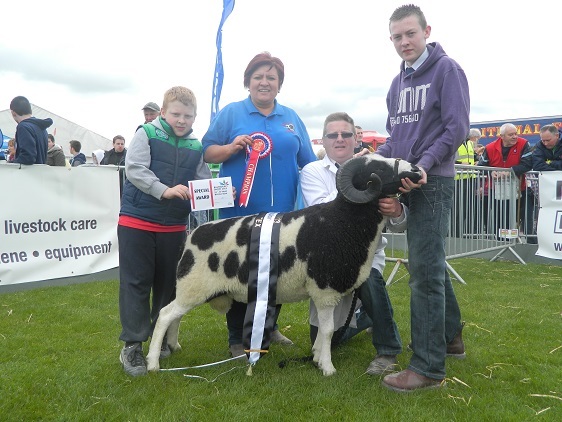 It turned out to be two very worthwhile days for the promotion of our breed as the Champion and Reserve had to come back on the Friday for the Interbreed Championship. 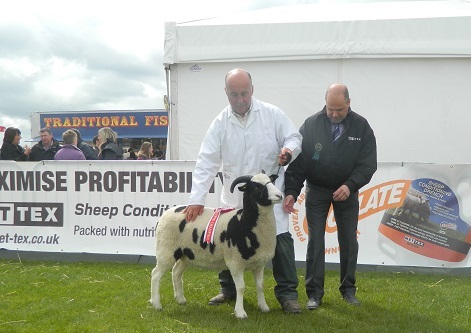 We were very happy to get a great introduction into the showing ring by the judge who made special mention that it was great to see such an old breed making a big comeback in the North. 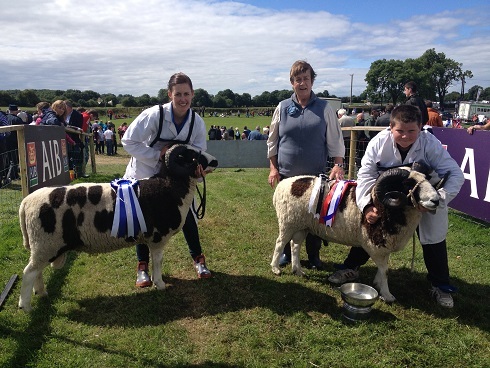 Shepherds Day (10th June) – This was the first time we held this event in the Ireland Region and it was a very enjoyable day. 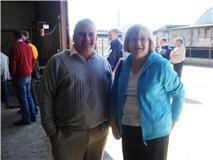 A big thank you to Derek Brown for hosting the event and going to so much effort in organising the day. 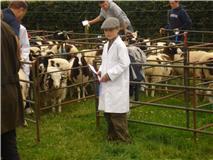 We got a lot of useful advice on preparing sheep for showing and thanks to the local vet for his talk. All members enjoyed a picnic lunch in the great weather. 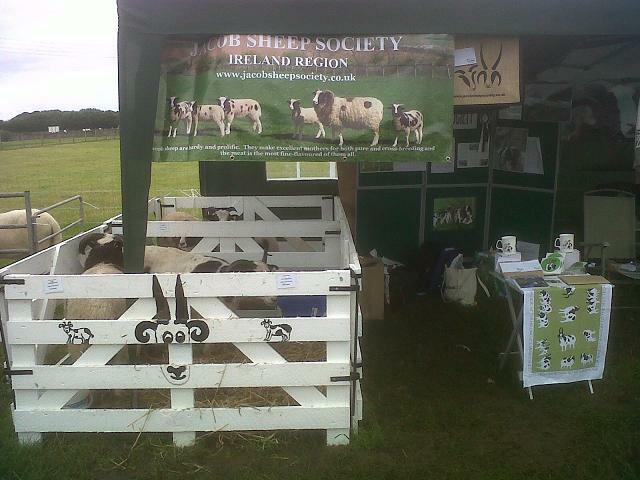 Sheep Ireland (30th June) – The sheep Ireland event was held in Athenry, Co Galway and apart from the weather it was a very succesful event and we had our new gazebo and two new banners on display. There was alot of interest in the Jacob stand and i would like to thank Martin Harney and the boys for all their hard work that went into setting up the stand. I am hopeful that we should gain some new members from this event. There was alot of breed promotion merchandise sold on the day including mugs, bags and tea towels. 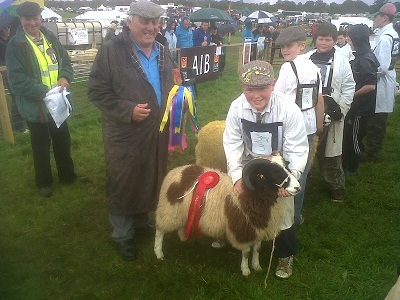 Mullingar Show (8th July) – Unfortunately Mullingar show was cancelled due to the bad weather. 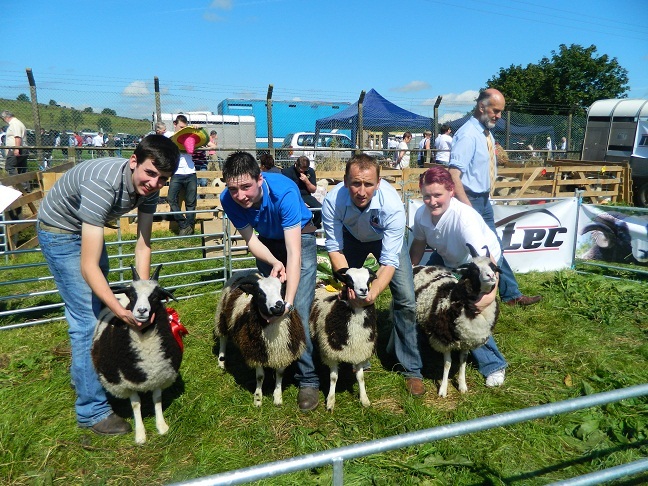 Flock Competition Sep 2012 – With 18 members entering the flock competition it was a very succesful weekend for the Ireland region. Jean Simmons and Jean Blacknell flew into belfast on friday morning and they spent the friday travelling around the 6 Northern flocks and then spent Sat,Sun and Mon am visiting the 12 Southern flocks. 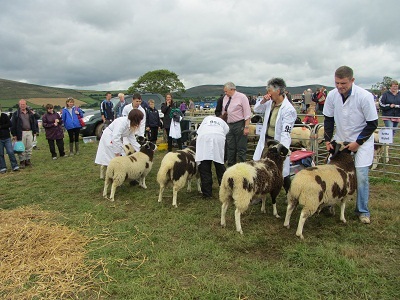 They were very impressed with the quality of sheep on display throughout the weekend and they gave each member lots of useful advice about their flocks. 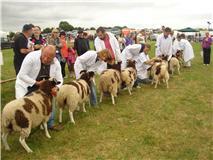 They took time to explain to everyone which sheep were up to good breed standard and those that weren’t. They had 18 flock visits in total to do over the 4 days and they travelled approx 1500 miles by car to get to all of these visits. This was alot of distance for the 2 judges to cover in a short space of time and i would like to thank them both greatly for all their help. (ps -it will probably take them a week to recover). I would like to thank Gabriel McCole for driving the judges on the saturday and to Geraldine Fletcher and Alison Gogan for accomadating the judges on the Saturday and Sunday nights. I would like to thank all the members who entered the competition and for all the effort that was involved in getting the sheep into sheds and individual pens. 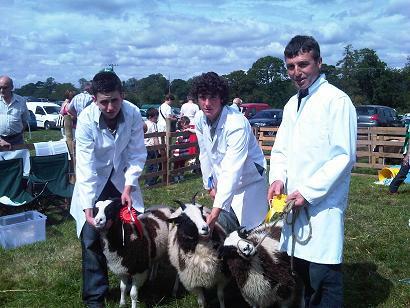 This saved alot of time at each visit and all sheep were presented superbly to the judges. I hope that all members found their visit beneficial and that we will all be able to use the advice given to help us to improve our flocks even more. The results will be announced at the Ireland agm in October. 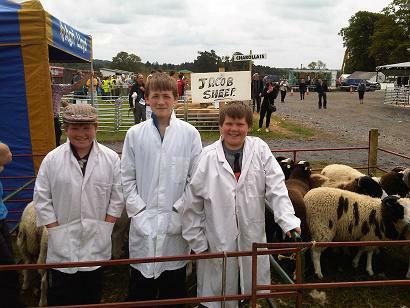 NATIONAL PLOUGHING CHAMPIONSHIP– A big thank you to all the members who helped out during the 3 day event on the stand and a special mention to Joseph for all the work involved in getting the sheep to the event in show condition and getting them home safely again. With huge crowds there was alot of interest in the JSS stand and we met alot of potential new members. 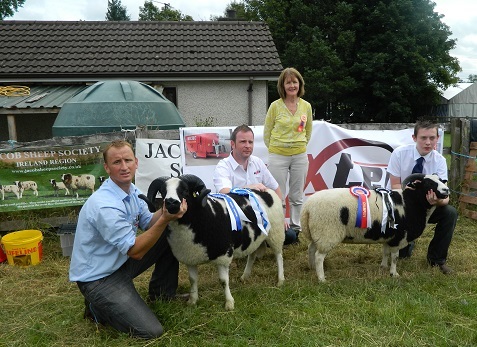 ENNISKILLEN SHOW 3RD AUG- Our first outing to Enniskillen show in Fermanagh was a very successful day for the Jacob Sheep Society and a big thank you to all members who attended. The show is very well run and we look forward to next year. 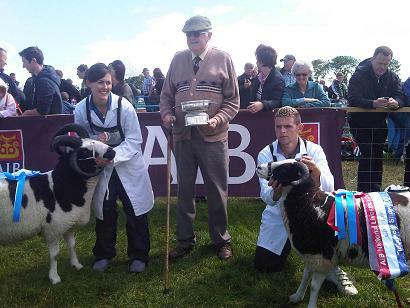 Once again the weather was great and a big thank you to our judge for the day Derek Brown who took alot of time judging our sheep and giving us plenty of good advice. 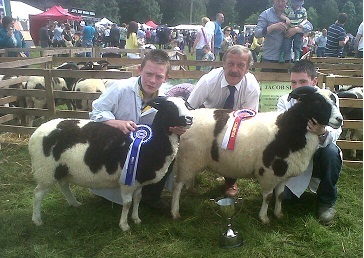 CARNEW SHOW 16TH JULY- The judge for the day was Richie Allen who awarded Champion and Reserve Champion to J Hughes. 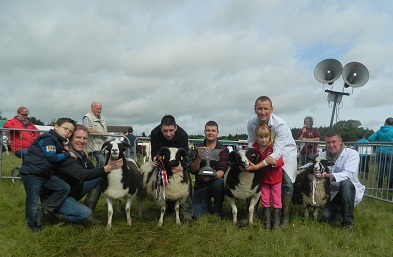 BALLYMENA SHOW 4TH JULY– The Nsa event was held at Ballymena mart with a fantastic turnout of pedigree breeds on display. The jacob stand created alot of interest and the jacob buzzer game was alot of fun for the kids. 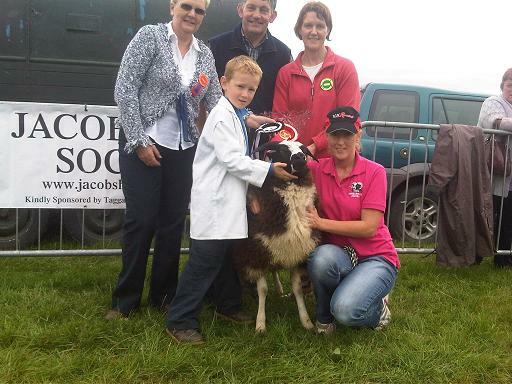 This is the first time that pedigree jacobs have been at an event like this in the north of the region and it proved very worthwhile as we met lots of people who keep non pedigree jacobs and also some people that had never even seen a jacob sheep before. 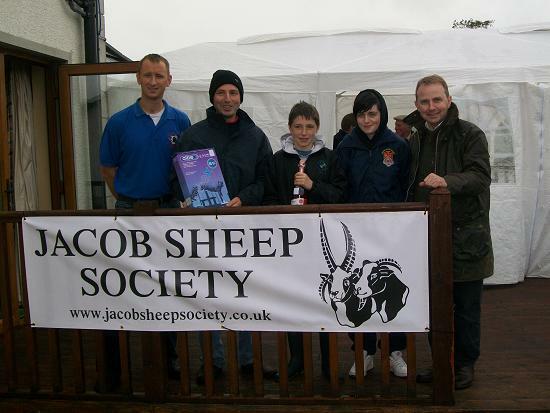 We handed out alot of leaflets to people that took an interest in our stand and had alot of positive feedback about our sheep. Looking forward to the next event run by the NSA as very well organised. 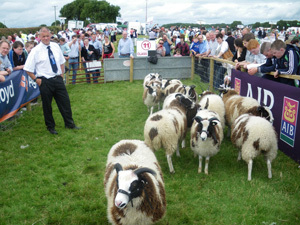 GOREY SHOW 18TH JUNE – The first show of the year in the south of the region was held at Gorey show on Sat 18th June. We had 2 classes on the day as this was the first time that Jacobs had been entered individually. The day was a good success and Joseph Hughes had a clean sweep of 1st,2nd and 3rd in both of the classes(Well done Joseph). Thanks to Glen Mcstay for organising this show and we hope that it will go from strength to strength in the years to come. 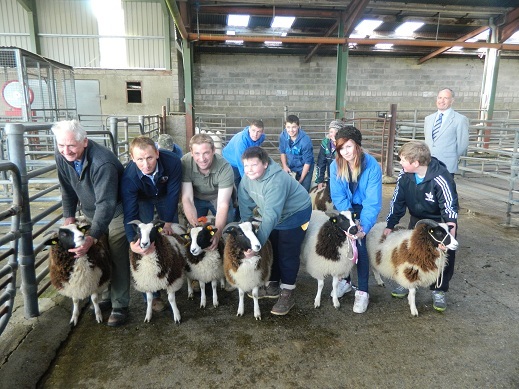 NORTH AND SOUTH OPEN DAYS (21ST + 22ND MAY) : The Irish region held two open days this year with our chairman Gareth Jones as our special guest. The first held at the home of the Kingarrow flock in Omagh was a very succesful day with over 40 people in attendance and approx 90 jacob sheep on show. 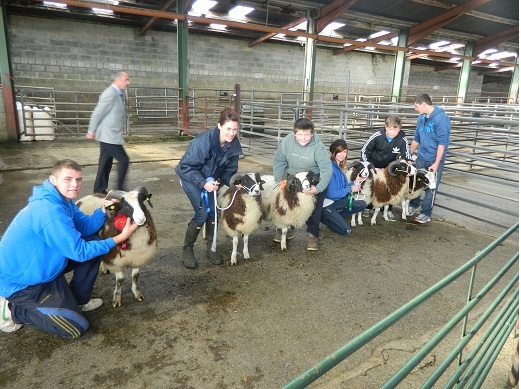 There was a shearing demo, spinning demo, preparing sheep for show and a stock judging competition. 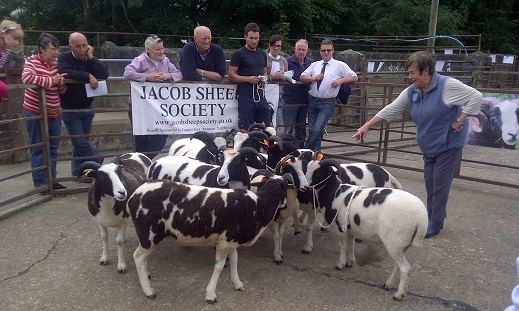 Derek Brown showed all the members and prospective new members how to get a Jacob ewe ready for show and explained the good and bad points that we would need to be aware off when buying and showing. 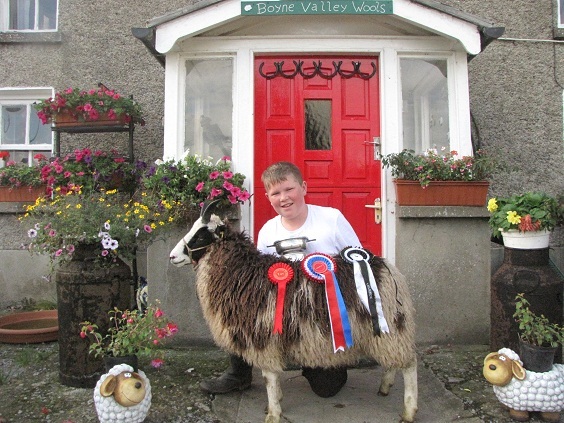 The second open day was held at the home of the Sugarloaf/Stonecroft flock in Co Wicklow. 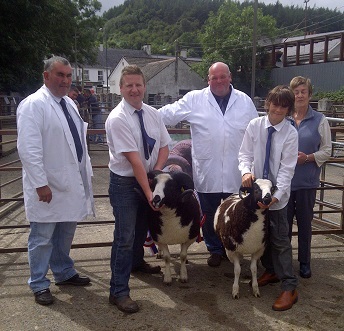 With another great turnout of people and some excellent sheep on show the members had a very interesting day. 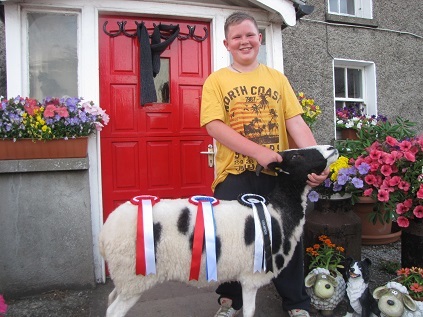 We had a mock judging competition (Gareth Jones – Judge) which created alot of different opinions about what members looked for in their sheep and this was followed by a superb barbecue kindly put on by the Fletcher family. Both open days brought alot of new faces into the society and hopefully our membership list will continue to grow with more days like this. Ps : Anyone who would like to host next years open days please let me know. 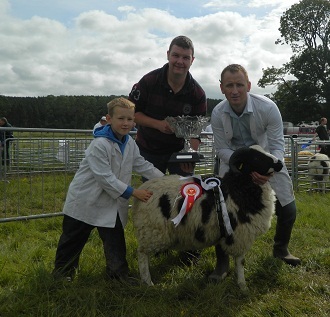 BALMORAL SHOW 12TH MAY – Paul + Alex Colhoun with their ram lamb who was placed 3rd. 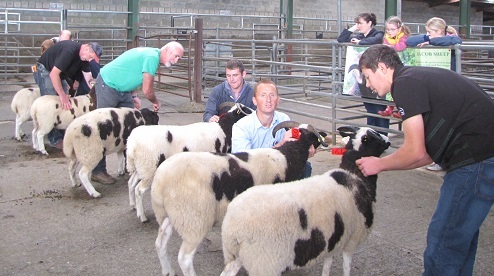 There were 17 females and 6 males entered in the sale. 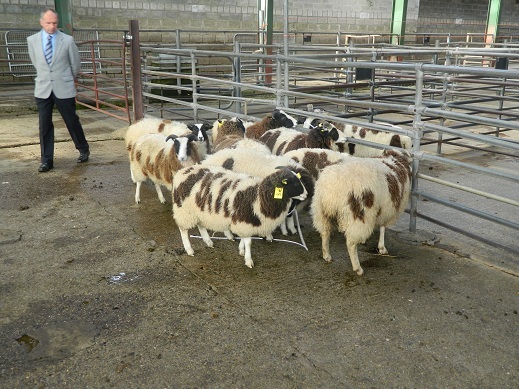 One adult female was withdrawn, one was not sold and the rest were sold and the highest price achieved was for Robin Darker’s ewe which sold for €320. 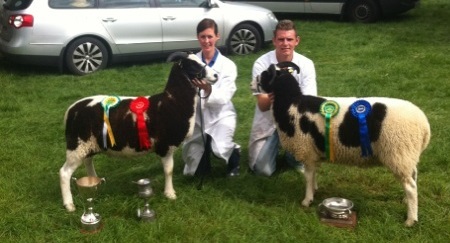 Only two of the ewe lambs achieved their price and were sold. 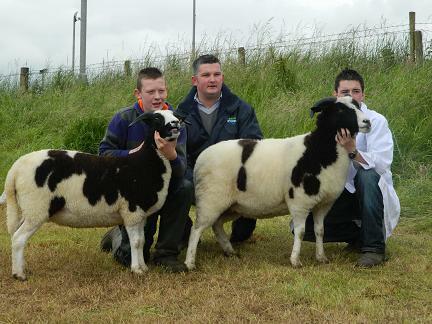 Two adult rams were entered for the sale and both were sold, two ram lambs were sold and two not sold. 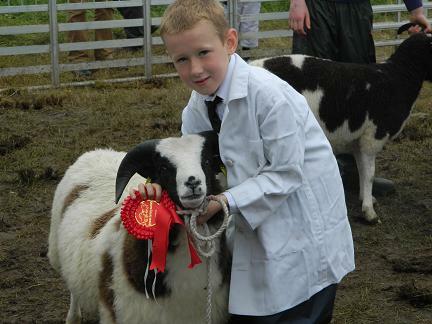 There was plenty of interest in quality animals and they achieved good prices.